The Captain heavy duty task chair from ERA makes for the perfect call center chair for 911 call centers, dispatch centers, and police departments. You only need to look at ERA’s curvy CAPTAIN heavy-duty task chair to know you’ll be working in total comfort all day long. The seat features floating spring suspension along with over-sized, contoured, foam-filled cushions, adjustable depth, and a rocker reclining back, and is pneumatically adjustable. 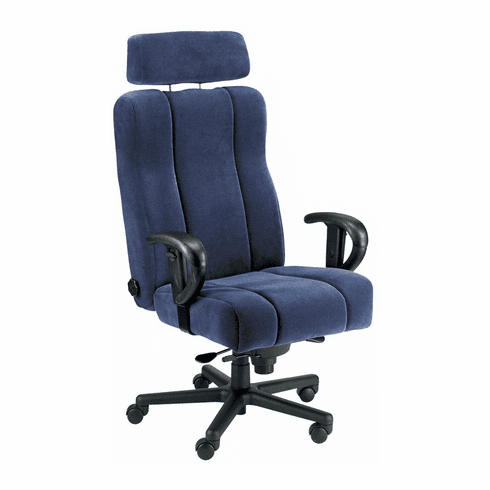 There’s also an adjustable padded headrest, and four-way adjustable lumbar support. Each chair is individually crafted when you order, and you can choose from leather, vinyl or fabric upholstery in a variety of colors. If you’re on the large side, that’s no problem – you can choose an optional, all-steel 30-inch base and/or flip-up arms for easy entry and exit. ERA offers a limited lifetime warranty on this superior chair.